I am a huge salad lover. Whether it’s a side salad or as an entree, nothing beats a good salad. And I especially love salads in the spring and summer when you can find fresh vegetables. Not to mention they’re usually healthy and can be a good side with dinner, so you get filled up on healthy vegetables and/or fruits, or a great easy lunch option. Just like my toasted corn macaroni salad, the salads in the widget above are all great for picnics, cookouts, barbeques, or any time you want a delicious salad. I love salads so much that I’ll add poached eggs, like the Spring Salad with Poached Eggs in the widget above, so I can have a breakfast salad! If you’ve never tried a salad that way, I highly recommend it! I hope you enjoy the 12 light and spring salads I’ve shared above. What’s your favorite spring salad from above? I am such a salad girl, you have no idea! Yay for this list! I love salads in the summer, too. All the fresh vegetables and it doesn’t heat up the kitchen! Thanks for this list. I like the variety here…thanks for sharing these. Definitely going to try some of these :). Great collection! I subscribed to it on Foodie, too! Geez, these salads look amazing!! Your toasted corn macaroni salad is something I would love to try! It looks delicious and I’m all about macaroni salad! So many good ones to choose from how could anyone pick just one?!? These sound great for summer! I can never have enough salad recipes. I try to eat a salad every day for lunch these ideas will come in handy! The spring fruit salad with the honey vinaigrette sounds refreshing for summer! It’s so pretty to look at too with all the beautiful colors. I love salads, especially in Spring! I think I’d go for the Toasted Corn Salad first – yum! Mmmm, they all look delicious! The tomato and cucumber or the chicken and strawberry salads look appealing. It has to be the chicken and strawberry salad. That looks outstanding! I love summer salads, and these sound unique. I love me a good salad and your toasted corn salad sounds AMAZING!!!!! What a great collection for Spring. They all look like delicious options. 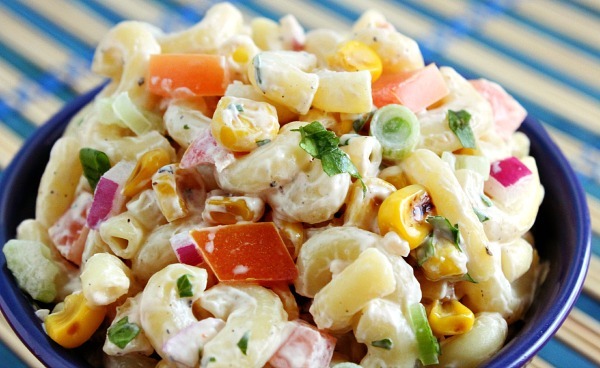 You had me at toasted corn macaroni salad! I love corn and macaroni! Why did I never think to put that in there?! I haven’t had macaroni salad in a long time. I’d love to make some soon. I am a true salad addict! I really like the idea of adding fresh berries to my salads and that watermelon feta combo sounds very interesting. I love salad, especially one that has ton of green in it! Nice collection of non-typical salads. I’ve already been eating salads with candied pecans and balsamic dressing but not with grilled peached. Yum! The edible flowers and dandelion greens looks delightful. I’ll have to make it for sure. I love a light salad. You’ve chosen some great ones.